The three main paddocks at Goodwood will be turned into three curated displays, a temporary mobile museum of sorts. The theme of these displays will be revealed over the coming months but they draw on the rich and varied influences on the retro scene and will include incredible cars. On the Saturday we will be running the track as a sprint in a similar manner to our Gathering event; on the Sunday the track will be turned over to Club Displays and Retro Parking. We also have special line-ups of cars from workshops and dealers for you to check out, along with quality catering, trade stands and a few surprises stashed around the venue. 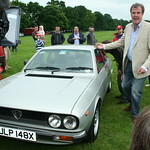 I have applied for 20 Club display passes for the Sunday, open to all Lancia's/ + all 70's 80's Italian cars. I've already had a fair amount of interest from the Fiat 131 Club, so we should be in good company. If you would like a display pass for the Sunday, add your name in the comments or send me a PM. Details below from the Retrorides team. Anyone who has already added their car will get an email soon with the ability to edit/update their info so will be able to add themselves to your stand if they forgot to do that. Thanks for your support so far, we're so excited for this show right now and can't wait for people see what we have in store.